Almost immediately after starting my new job in Melbourne I was given the opportunity to fly out to Sydney for business. I made the most of this occasion and decided to stick around after Friday for the weekend to check out the fine dining scene. 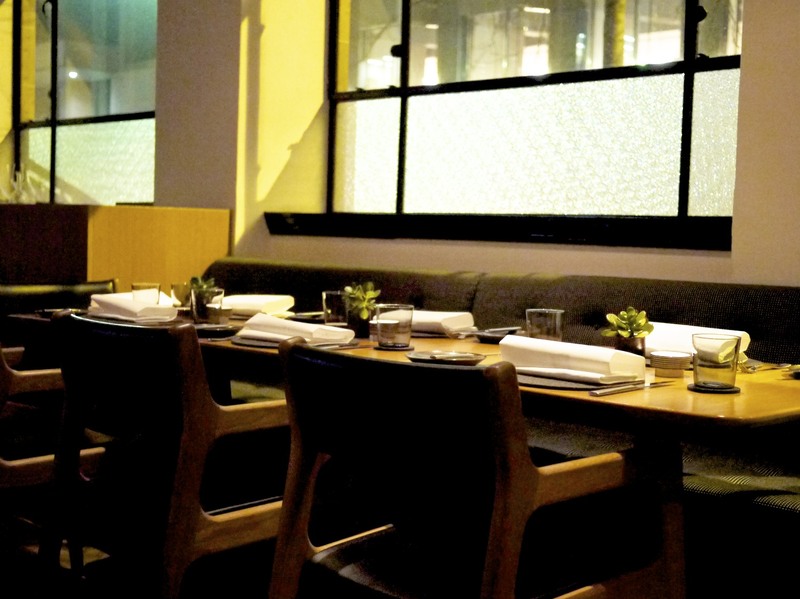 I had mixed feelings about my last fine dining experience in Sydney at the highly acclaimed Quay, so my expectations weren’t astronomical. I had one booking already made for Sixpenny but naturally I wasn’t going to settle with just one meal! I did however want to avoid a second extensive degustation menu and after some enquiries with my sources I stumbled upon The Bridge Room. I was looking for something not too fussy. Something fairly casual. Somewhere that served just good food. The reviews claimed to be all that and more, so here I was. 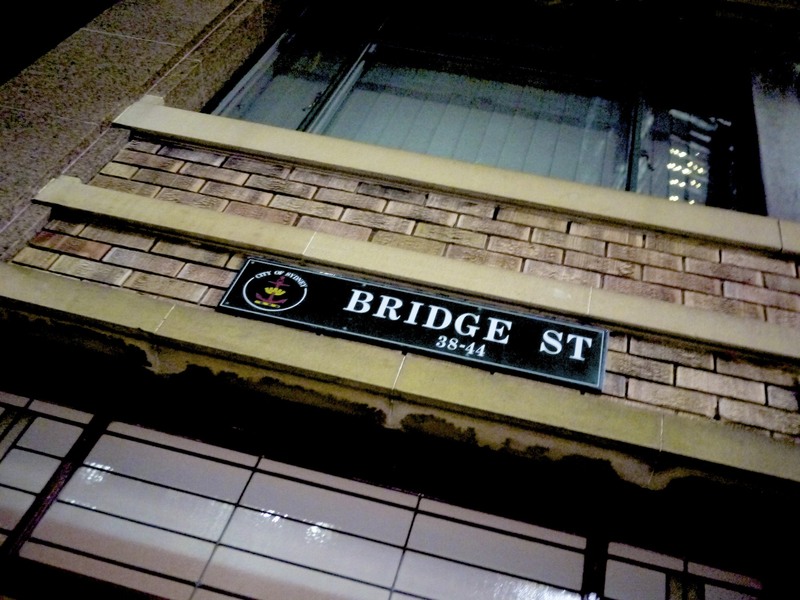 Located on the bustling road of Bridge street in the heart of Sydney’s CBD, it’s quite easy to walk past The Bridge Room without taking too much notice it. At a quick glance from outside you could sense, from the minimalist contemporary interior design and furniture, that this place was quietly confident. An elongated dining room with a nordic theme reminiscent to Noma and its ilk, there’s no flashy statement being made here. As I stepped inside I was professionally greeted by the friendly restaurant manager Martijn De Boer who previously worked at one of my favourite restaurants, De Librije, and guided immediately to my table. I took a good look around and I couldn’t remember the last time I was surrounded by so many suited professionals at a fine dining restaurant. I guess that was expected with the location on a weekday. 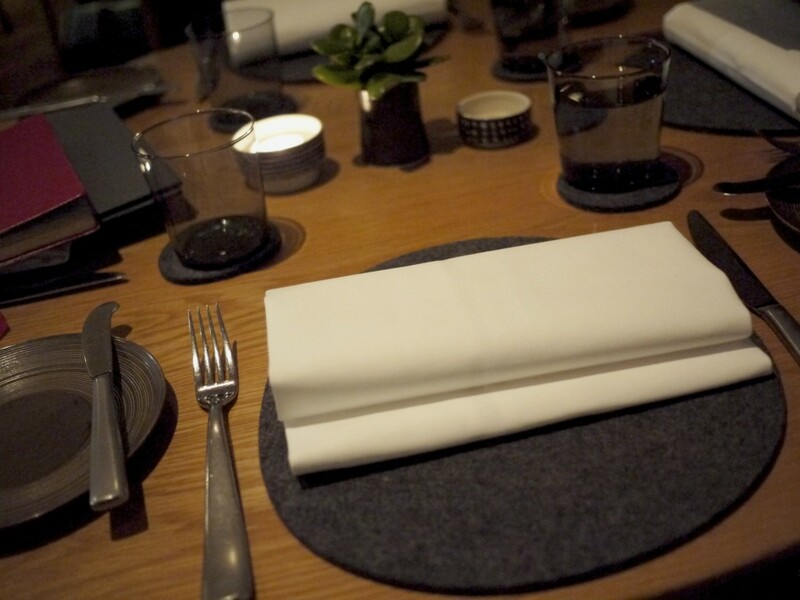 The minimal Nordic theme resonated with the tableware with the noticeable asbence of table cloth. As I hovered over the à la carte menu, a glass of Clover Hill 2008, Pipers River, Tasmania appeared in front of me to whet my appetite. Shame there was no amuse bouche to go with it. At least I had some bread to tie me over to the starter. 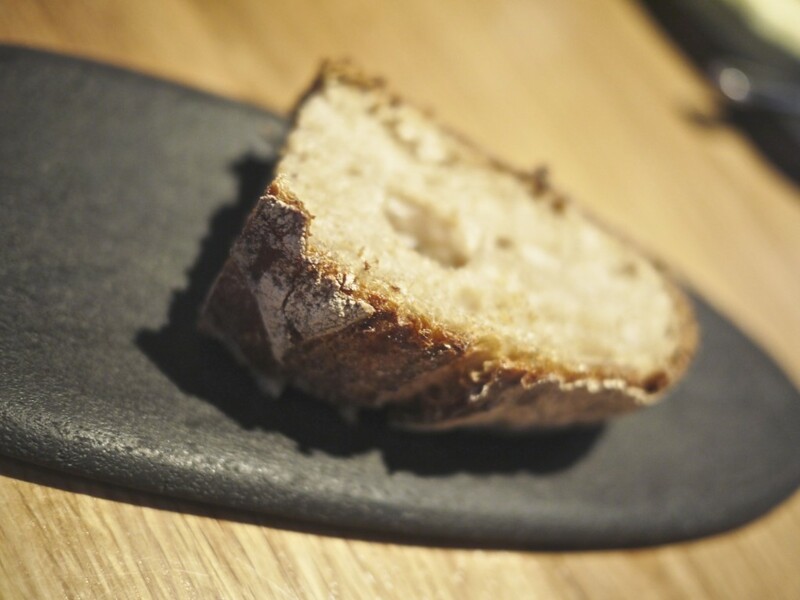 The choice of bread was either a sourdough or rye bread which was supplied by Sonoma bakery, one of the main suppliers in Sydney to many a fine dining restaurants such as Quay, est. and Momofuku Seiobo. 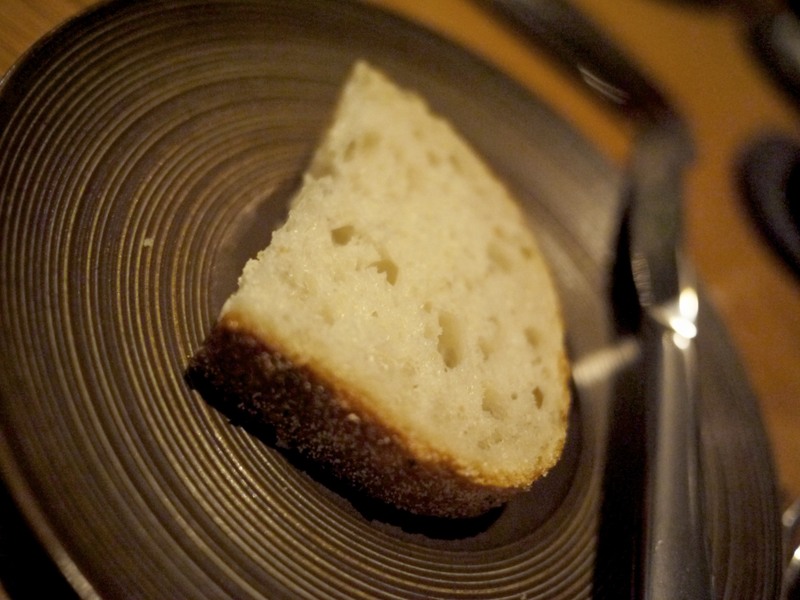 The bread was palatable with a decent texture and airiness but admittedly nothing special. I must admit that for a quietly confident restaurant I hoped the bread would be home made but it would be perhaps harsh to penalise them when it seems to be the norm amongst the big hitters in Sydney. Where was Mikael Jonsson when you needed him? The choice of wine for the evening were both naturally Australian and selected by the savy sommelier. I’ve pretty much made a quiet decision that when any opportunity arises I will always try to expand my repertoire of Australian wines. The first wine to match our starter was the David Hook Pothana Vineyard Semillon 2007, Hunter Valley, New South Wales. It had a decent power on the palate with great aromas of citrus and savoury essence. 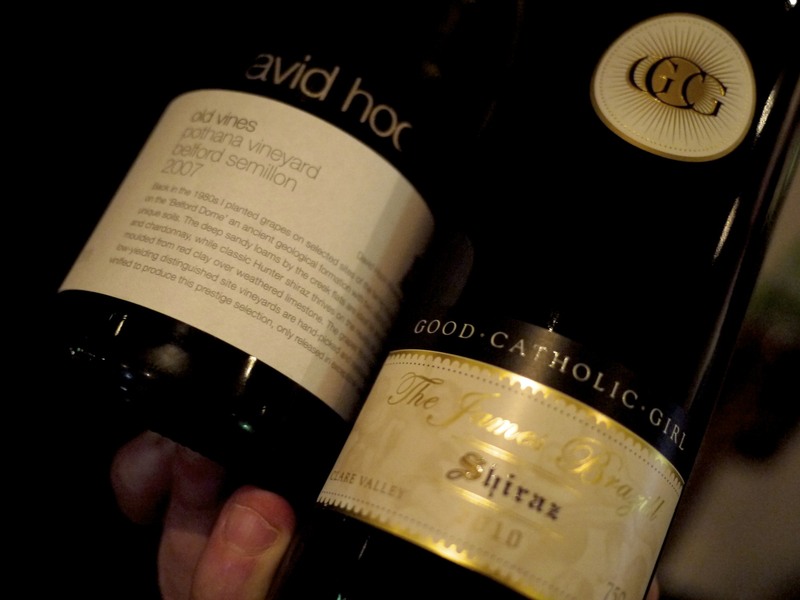 Our sommelier also prompted me simultaneously to try the Good Catholic Girl, James Brazil 2010, Clare Valley, South Australia as it would require a bit of decanter. There were quite a few starters which looked appealing. 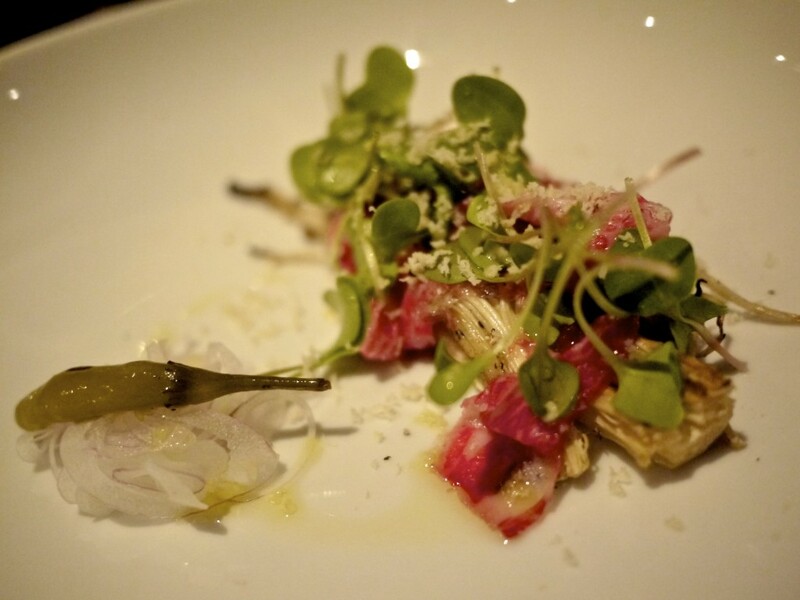 Perhaps it was the fond memories of my childhood going down to our local robata restaurant (the Japanese equivalent of a barbecue where food is slowly grilled over hot coal) that made me choose the Raw wagyu shoulder, robata smoked enoki mushrooms, celtic sea salt, fresh horseradish, soft pickled chilli. It was an extremely light dish that suited the warmer climate of Sydney. 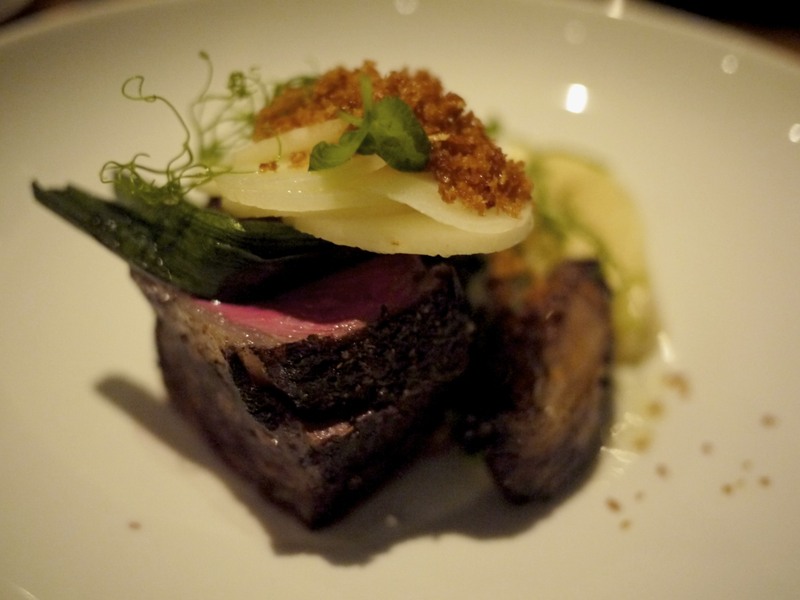 The highlight for me was the combination of the smokey enoki mushroom and the creamy wagyu that melted in your mouth. The heat from the pickled chilli was well balanced but I found the horseradish dominated the palate when you had a mouthful of everything at once. A decent dish but not without fault. Unbeknownst to me at the time, our decantered red wine was a venture of Julie Barry, the daughter of the late Jim Barry who’s wine I’ve enjoyed on a couple of occasions. The shiraz was the perfect wine to accompany the Robata grilled Junee lamb, parsnips, salt grilled leek, zucchini, coriander seed. The lamb was cooked exactly the way I like it, pink. It had a good texture and the slightly fattier piece had some good flavours but I confess it paled in comparison to the lamb from the Sportsman in Kent, outside London UK. I knew that Kentish lamb would come to haunt me in the future. I also wasn’t too sure about the garnishes and decorations as I felt they detracted from the flavour of the meat. I also ordered a side of Dutch cream potatoes, puréed with Joseph olive oil. I really enjoyed the side dish surprisingly. 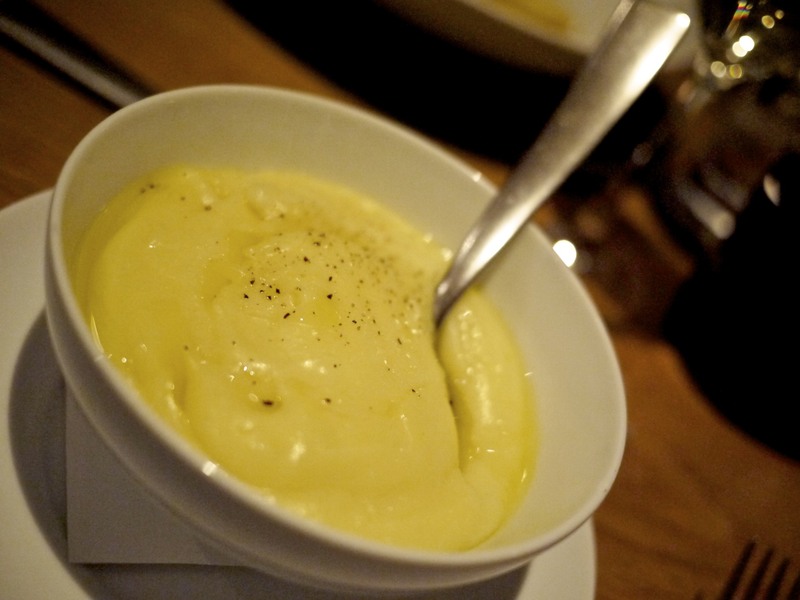 It was nicely seasoned and had a lovely texture resembling the aligot I had in Michel Bras. I had no issue mopping this up at all! 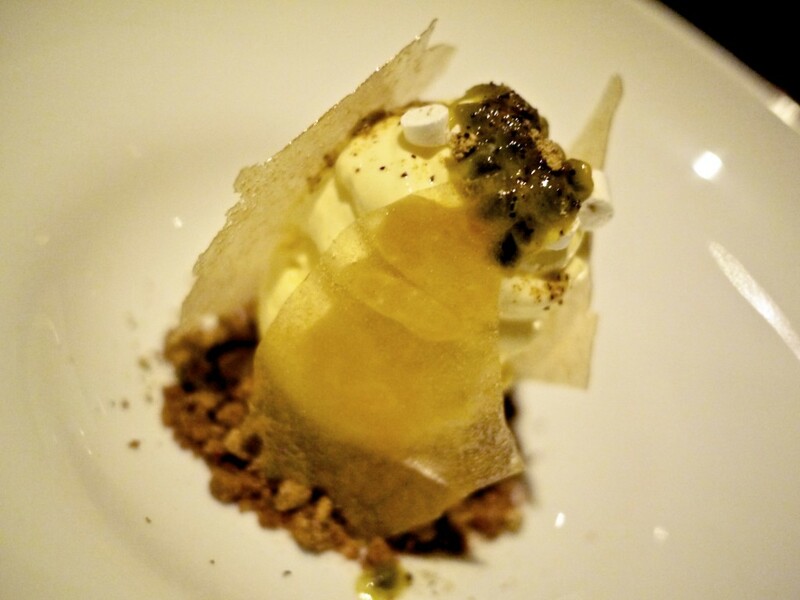 Fortunately the dessert dish of the Aerated passionfruit, roasted nougatine, passionfruit ice cream, passionfruit seed powder, glass biscuit saved the meal from being a completely mediocre one. It was well balanced in sweetness against the slight tartness from the passionfruit and had an interesting variety of textural contrast from the brittle sugar work and crunchy nougatine to the soft meringue and ice cream. What’s more, each component was right in proportion. The honest truth is that my dinner at The Bridge Room didn’t redeem my faith in the fine dining scene in Sydney. Perhaps I had an off day but I honestly couldn’t rate this place in the same league as some of the other fine dining establishments I have tried in Australia. Don’t get me wrong, I wasn’t after flashy dishes with look-at-me wizardries and gimmicks. I was just after good honest food and that’s what I was promised, at least on paper. But what I got instead were a couple of dishes that had moments of brilliance, yet let down by imperfections and overshadowed by other personal experiences. The highlight of the dessert and the service from the front of house were however redeeming features and the wine impeccably chosen. I’d certainly recommend this place for a casual meal but nothing more. This entry was posted in Australia and tagged Bridge Room, Jim Barry, Julie Barry, Martijn de Boer, Mikael Jonsson, Ross Lusted, Sonoma, Sydney on November 8, 2013 by admin. Mikael Jonsson is a man on a mission. A man with an obsession for sourcing top quality ingredients. After quitting his job as a lawyer, the influential food blogger behind Gastroville took a long journey around the United Kingdom and neighbouring countries to discover the best ingredients in europe before realising his dream in the restaurant, Hedone. How appropriate then to name his restaurant after his quest for maximising pleasure to the palate. 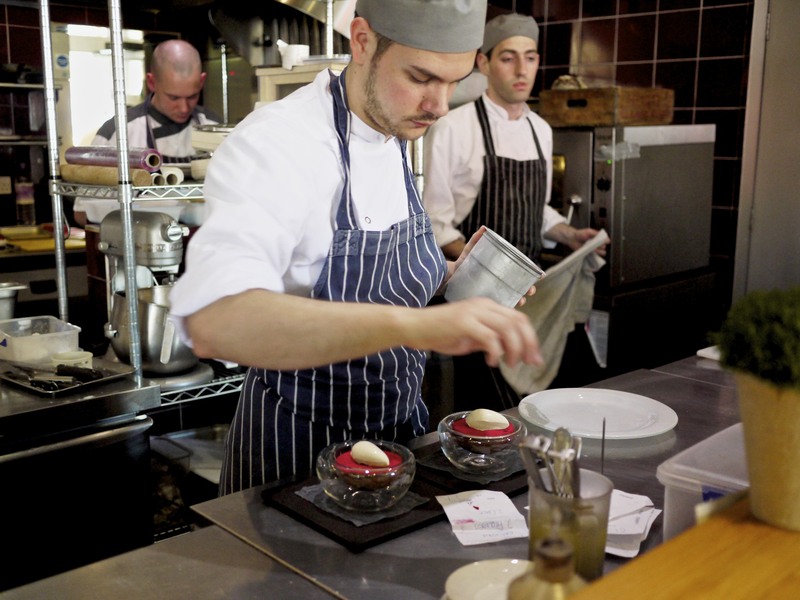 His motto is simple – perfect dishes can only be created by using the best ingredients handled with minimal interference. It is an impressive feat that despite only openning the restaurant in July 2011 Jonsson has already achieved a prestigious Michelin star to his name and jumped straight on to the San Pellegrino 50 Best Restaurant List at a very respectable 70th position. Fortunately, unlike many of the eye-wateringly expensive restaurants on that list that end up being for “special occasion only”, Jonsson has concentrated on attracting a more stable clientele. 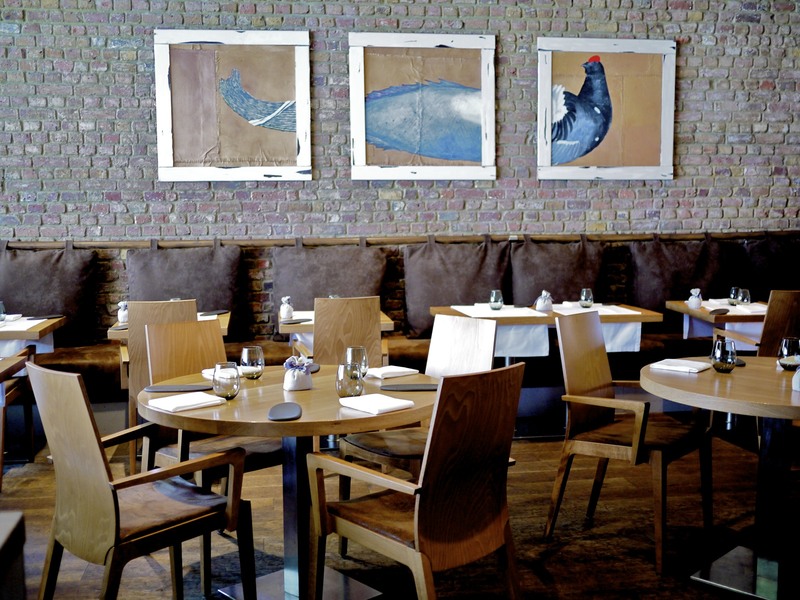 Somewhere that diners could return frequently; offering a reasonably priced three course options that changes everyday. Jonsson was happy to tell me that there was even one guy who had dined more than 130 times to date! The chef had even awarded him a plaque on the highstool my friend was sitting on. Now that’s an impressive record for anyone! This was my first meal here. 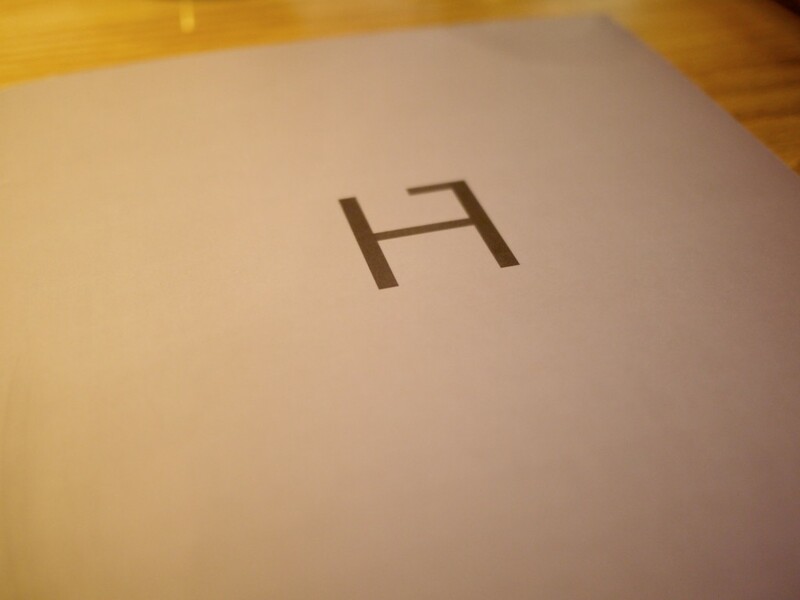 Therefore, I opted for his ultimate carte blanche menu coming in at £85 for lunch (£95 for dinner). Sure, it’s not a cheap menu but when you consider the quality of ingredients incorporated in the dishes you soon realise that it’s a bloody good deal. The only down side in the whole affair was the location of the restaurant. Chiswick, on the complete oposite side of London from where I was staying, is situated on the district line which is notorious for being unreliable, particularly on weekends. My visit was no exception; planned engineering works all weekend. Thank you TFL. Taxi it was then. 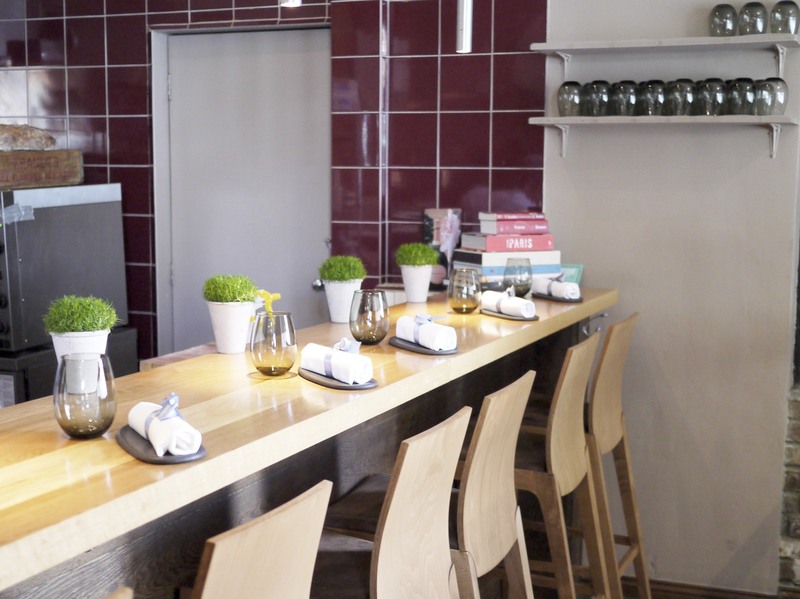 My friend and I were the first ones to arrive at the restaurant so we decided to occupy the kitchen counter seats, a definite recommendation if you want to see all the action in the kitchen. It didn’t take long for our amuse bouches to arrive after taking our orders. 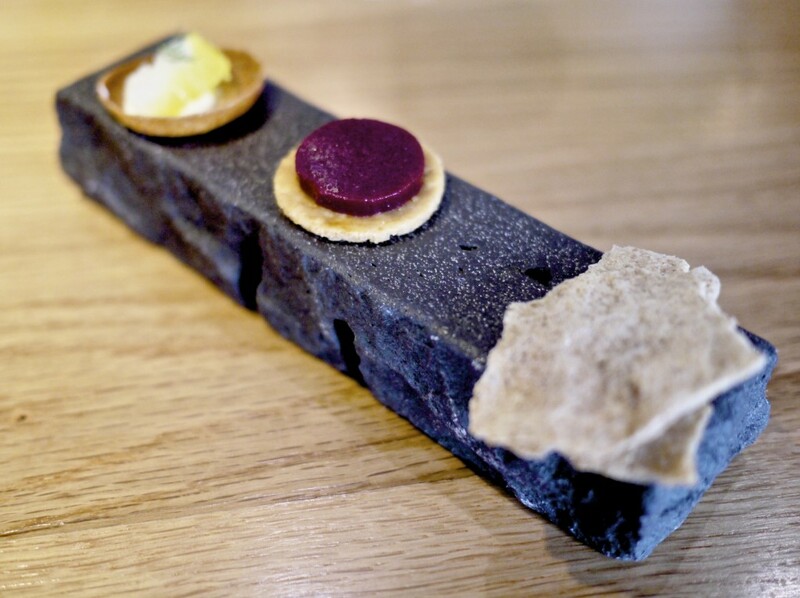 Starting from the left was a Smoked haddock tartlet with lemon rind, followed by an intensley cheesy Parmesan sablé biscuit with a morello cherry jelly and finally a Foie gras marinated in quince & balsamic vinegar sandwiched between sourdough crisps with sweet spices. A lovely progression in strength of flavours across the three morsels. Simple but elegant, and most importantly tasty. 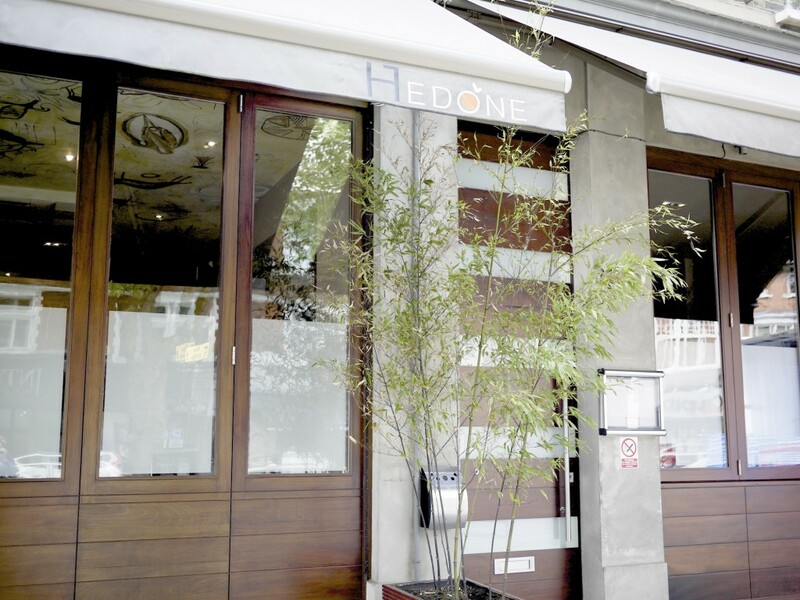 I had heard countless praises sung by many bloggers and food critics alike on the quality of the house made bread at Hedone. Jonsson had spent some time with Alex Croquet in France in the art of bread making. Sure enough, the sourdough bread with unpasteurised butter was faultless and possibly the best I’ve ever had. It had the perfect crust, alluring smell and airy texture. Good bread is the most satisfying of all foods, and when served with butter I would go as far as sayng it is a feast on its own. Only on my fourth slice did my friend have to intervene and point out the obvious, we haven’t even started the meal yet. Reluctantly I put the bread down… slowly. First course on the menu were Poached Cornish rock oysters, granny smith, shallots. The one on the right which had been poached for 45 mins and smoked lightly in juniper berries was sublime. The meaty oyster had soaked up the beautiful smokiness and dissolved gradually in my mouth with little effort. 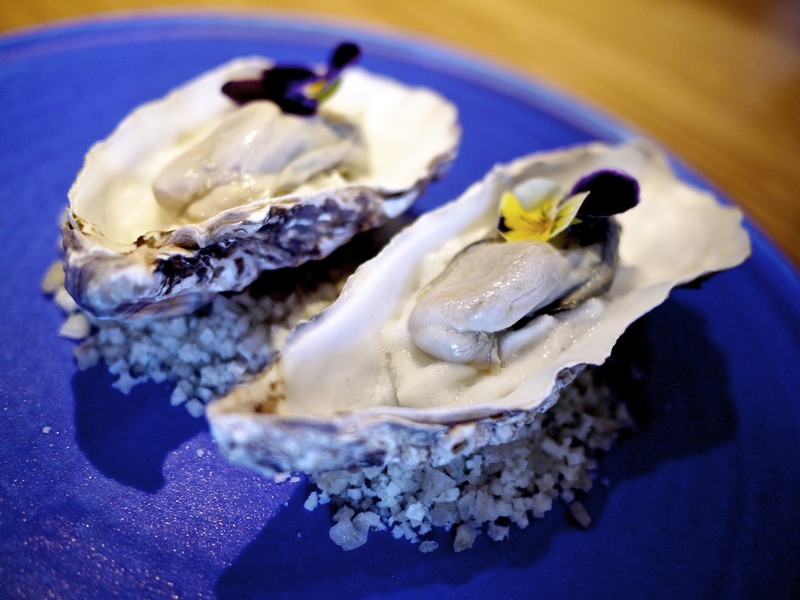 This was one of my favourite oyster dish that was almost on par with Richard Ekkebus’ one at Amber. What a great start! 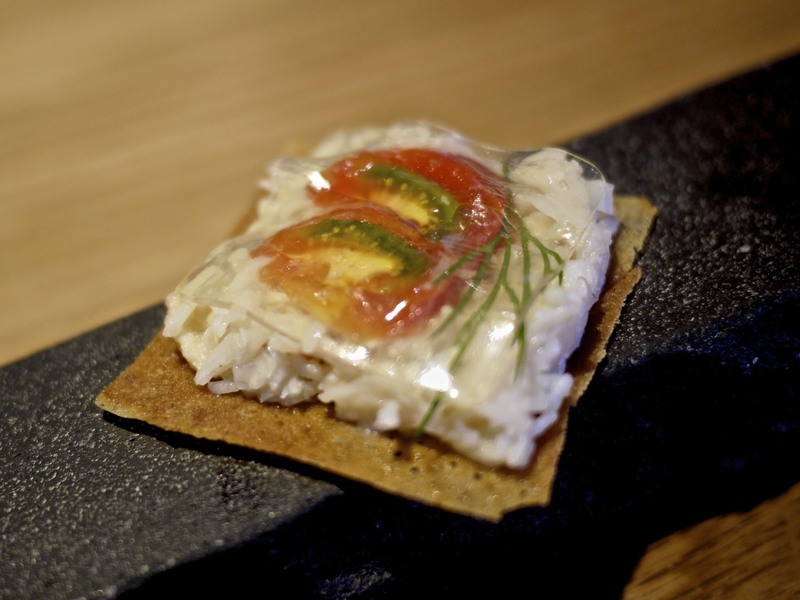 Up next was a new course that was being served for the first time – Dorset crab sandwich. A buckwheat crisp was garnished with Dorset white crab meat, confit marinda tomato, fresh dill and a transparent tomato essence jelly. It had a lovely crispy texture and the sweetness from the crab meat was complemented by the lovely fresh tomato flavour from the jelly. The last hit of flavour was the slightly bitter dill that provided a good contrast to the sweetness, finishing off with a refreshing note. Very good indeed. Simplicity at its best was the Foie gras and cepes. 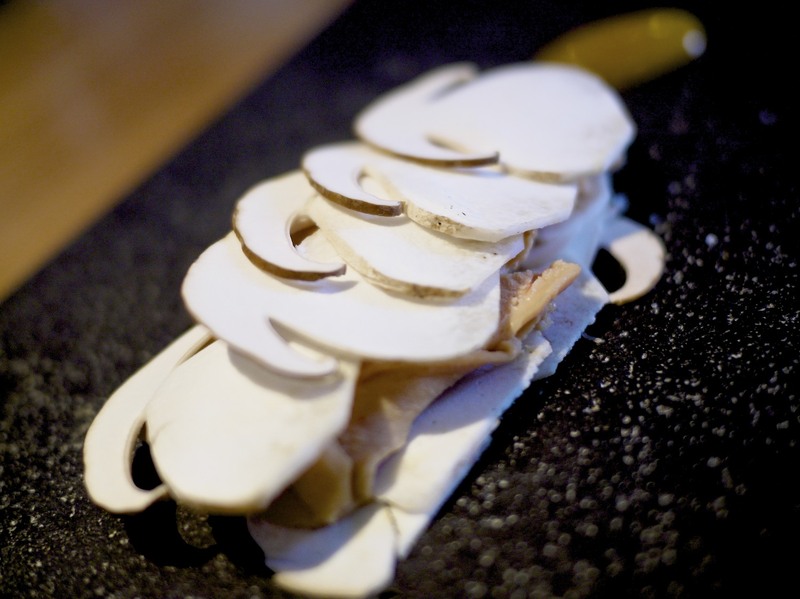 The raw cepes of the season sandwiched the delicious foie gras and a dollop of apricot jam was served on the side. 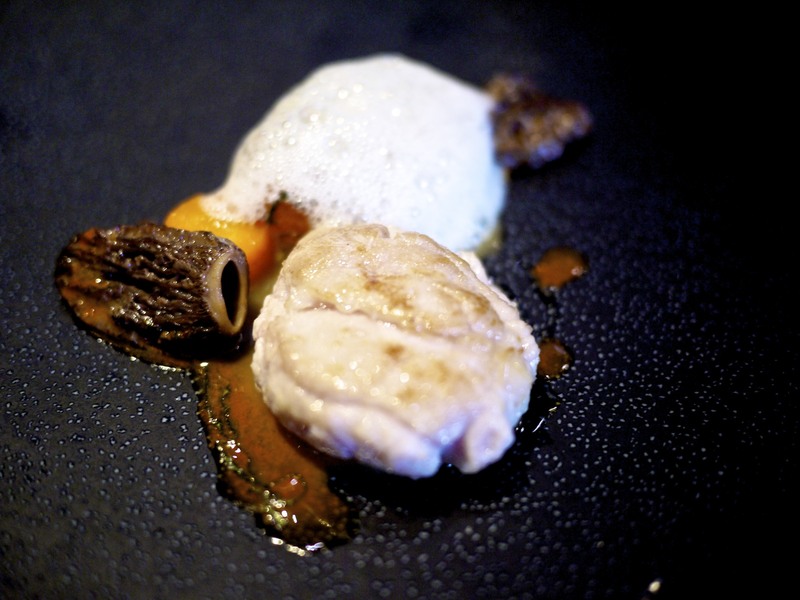 The mushroom was very meaty and the apricot jam added a sweet fragrance that cut through the rich foie gras. The seasoning, just of a pinch of salt, was spot on. This was without a shadow of a doubt one of the best dish that lunch. Photos could not do any justice to the Umami flan which, although one dimensional in texture, was bursting with flavour. 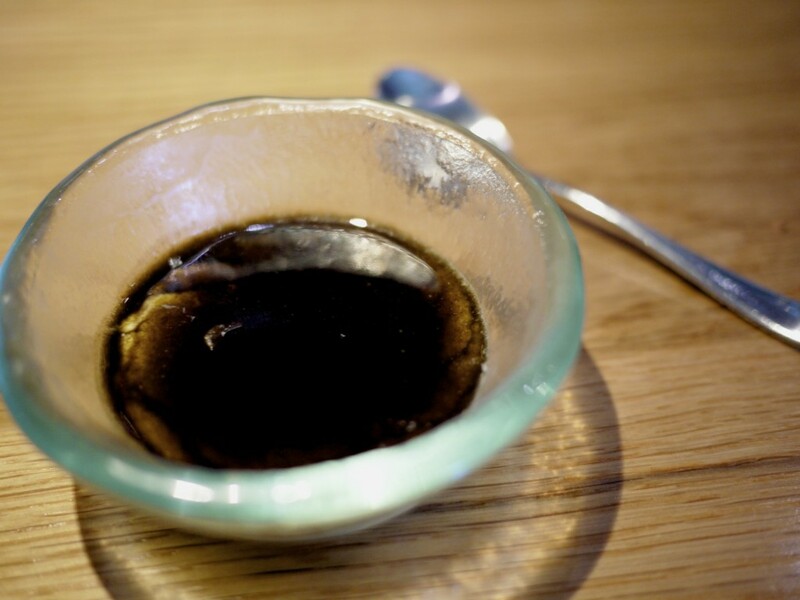 The flan, which I believe had been made with dashi or something similar, was topped with a nori (seaweed) coulis. For me it resembled closer to a “chawanmushi” rather than a flan but I was impressed with the depth of flavour and tongue coating savouriness that made me salivate the more I ate. After wolfing down another morsel of that delicious bread (I blame the umami flan! ), a succulent dish of the Loire Valley green asparagus, Dorset wild garlic, pistachio mayonnaise was presented. 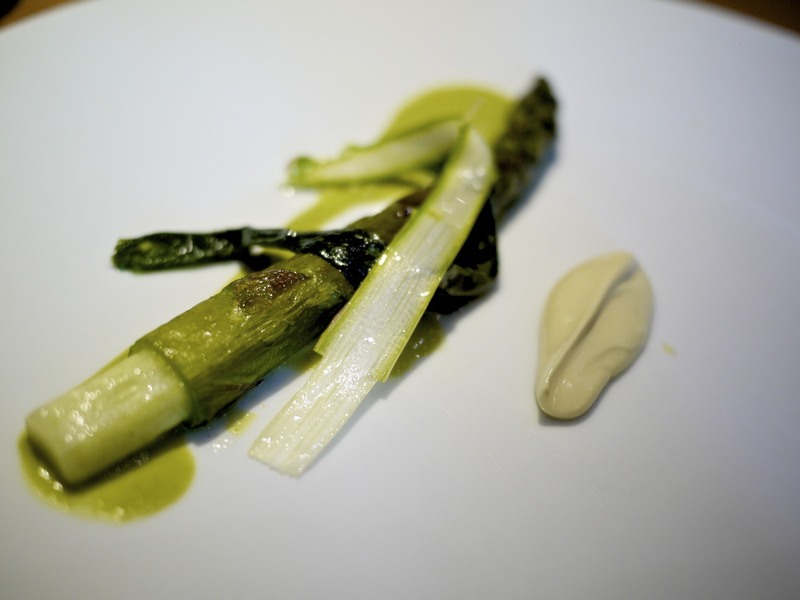 There was a sweet nuttiness in the eggwhite mayonnaise that went ever so well with the juicy asparagus and garlic stalk. 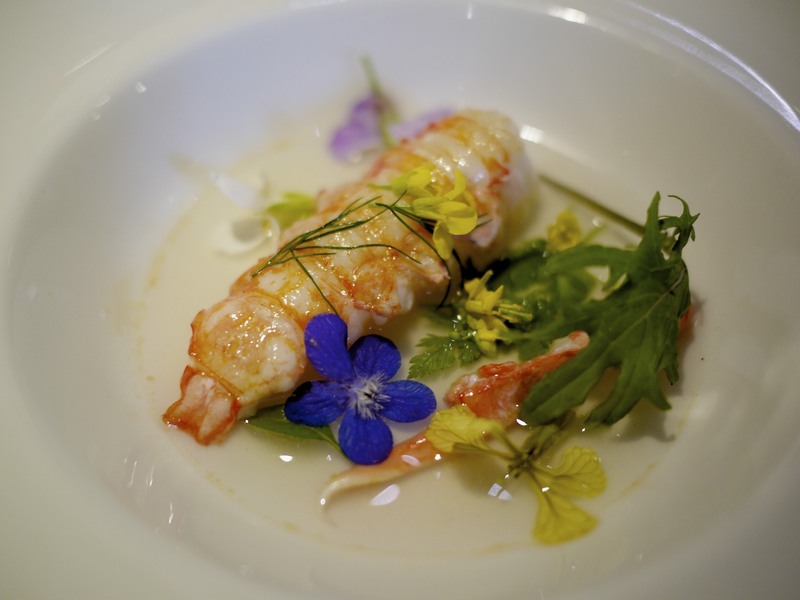 The Scottish langoustine tail, crustaceans jus, herbs and flowers was definitely fresh as I saw a little green insect crawling on my langoustine. I assume the little fella had come from the box containing the herbs and flowers. I didn’t mind him and flicked him aside. At least I knew the garnishes were fresh! The sweet langoustine was served at the right temperature, warm but not scorching hot, and perfectly accompanied by the shellfish bouillon which gave it that depth of the “flavour of the sea”. First of the fish courses was the Dorset Wild turbot, red orach, spinach, fresh almonds. 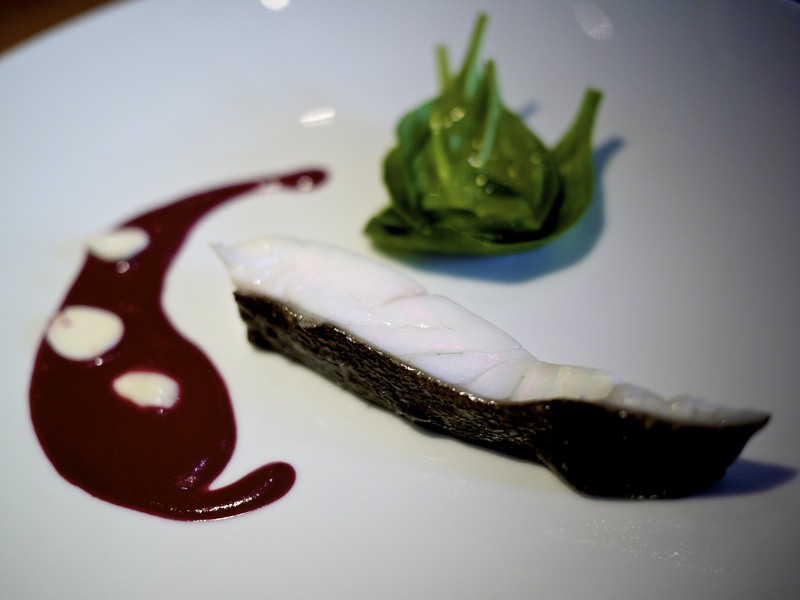 The rainbow like sheen on the turbot fillet was due to the natural gelatin from the fish and reflected yet again on the quality of the fish. The white spinach sauce mixed well with the red orach jus reduction which has a more pleasant and less bitter taste than spinach. I did however find several small bits of bones in the fish which was slightly disappointing. 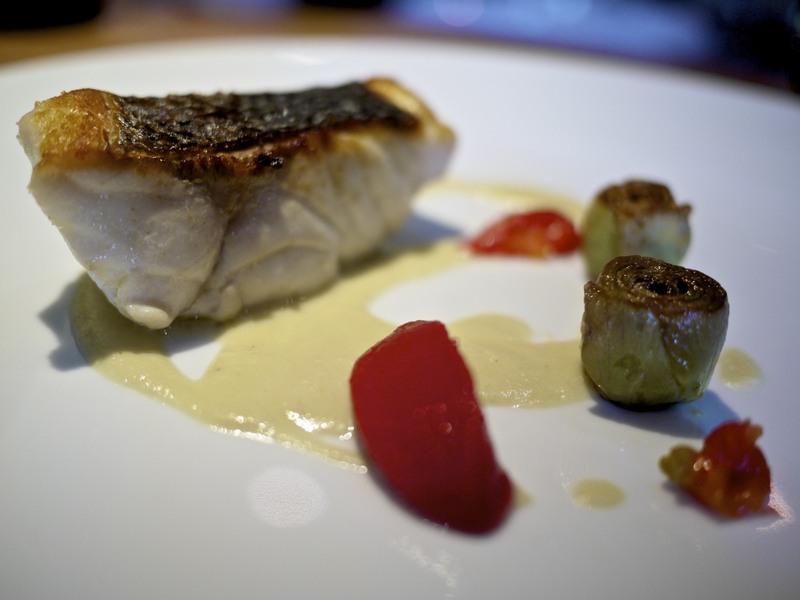 I did find it rather odd to have another fish fillet course but I admit I was glad to have tried the Dorset line caught wild seabass, artichokes, piattoni beans, confit Marinda tomato as it was better than the turbot in my opinion. The smokiness from the tomato pulp purée was appetising to say the least. I know I sound like a broken record but the quality of this seabass was sensational and I never knew artichokes worked so well with it, both in a purée form and in its entirety. I was surprised to find a pasta course (Liquid ravioli, roscott onion consommé, mild horseradish) given Jonsson’s cuisine otherwise was undeniably French. 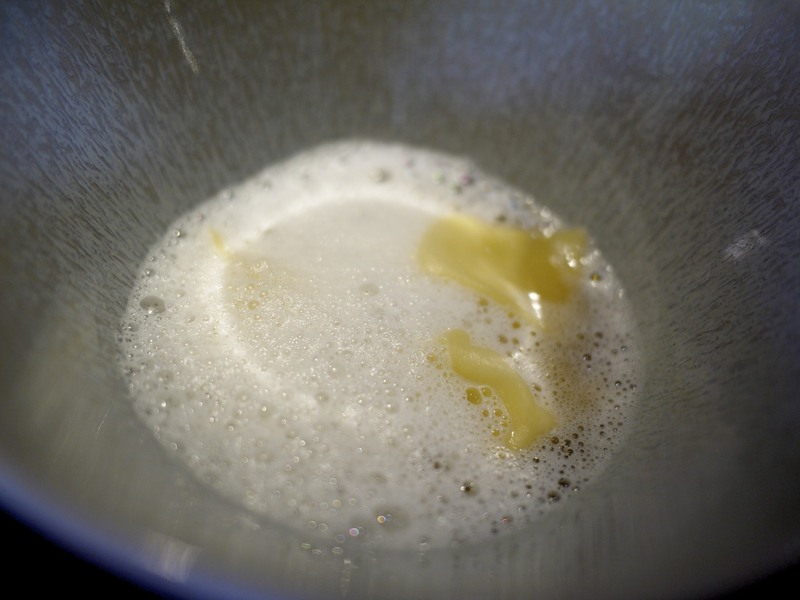 The salty smoked pancetta swam harmoniously in the sweet onion consommé and creamy parmesan cheese, with a slight kick from the horseradish emulsion. It was at this point that I found Jonsson looking around to see what he was going to serve next. He approached us and explained that he had just received some top quality sweetbread which he occasionally got from his only trusted supplier in Paris. With a unanimous nod from both of us he quickly prepared the Veal sweetbread, baby carrot, basil, jerusalem artichoke. The earthy morrels were clean with no trace of sand unlike my last experience at Les Cols. Phew! 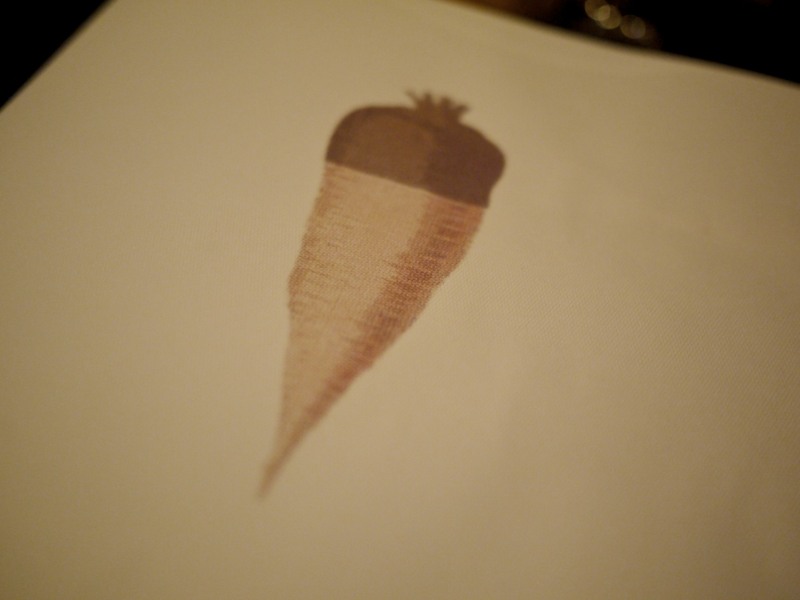 It was a sweet dish with contrasting textures from the crunchy carrot, meaty morrels and the creamy sweetbreads. Unfortunately for me, the latter was too thick, with the wrong ratio of the caramelised surface to the creamy texture. I do like sweetbreads but I found it rather too much after a few mouthfuls. 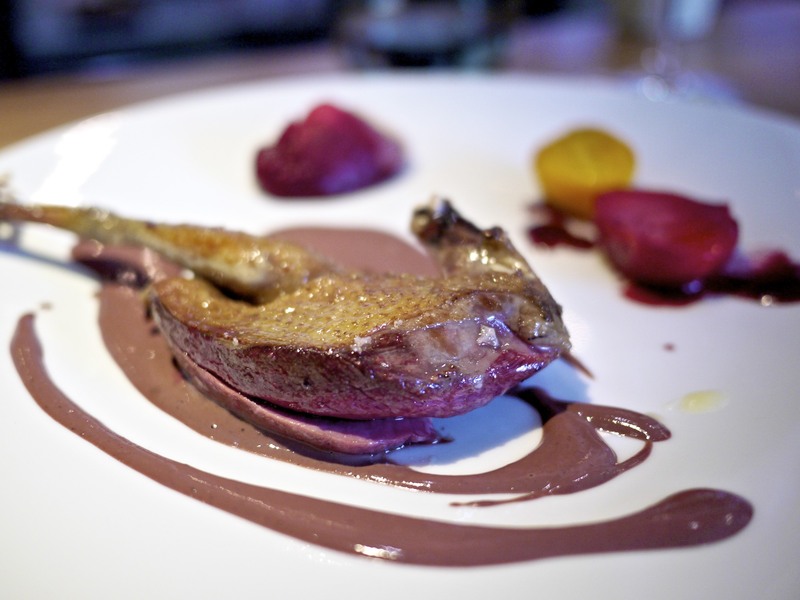 I recently had a phenomenal pigeon dish at Azurmendi and the next course of the Roasted leg and breast squab pigeon, beetroot five ways came pretty close. 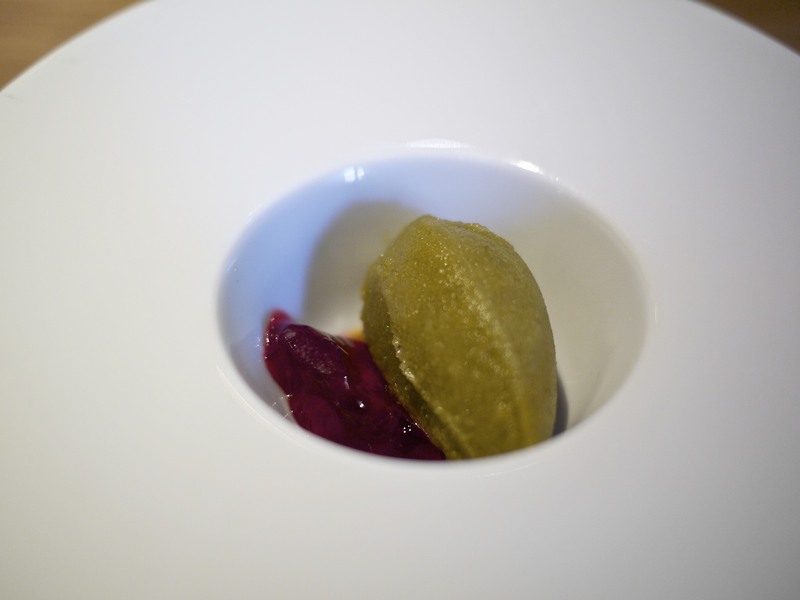 The beetroot came smoked, pickeled, puréed, in a coulis and also incorporated in the offal sauce. The remarkable part about this dish was that the offal sauce was in complete harmony with the pigeon and by no means dominated the palate, no easy feat! Jonsson later explained that the pigeon had been strangled (I hoped humanely) to retain the blood to keep the meat juicy. It certainly was that and more. Delicious. Alright, I admit it. You’re probably wondering how I managed to eat so much after helping myself to five slices of bread? The truth was that I was stuffed and therefore glad to see our palate cleanser of Granite, hibiscus, and campari jelly before the final two segments of our dessert. The palate cleanser was refreshing and the combination of mint, thyme, tarragon, parsley and cordiander made it very zingy yet retaining a right amount of sweetness. It was as if someone had smacked my jaws and brought me back to life. I was back in the game. Bring on the desserts! 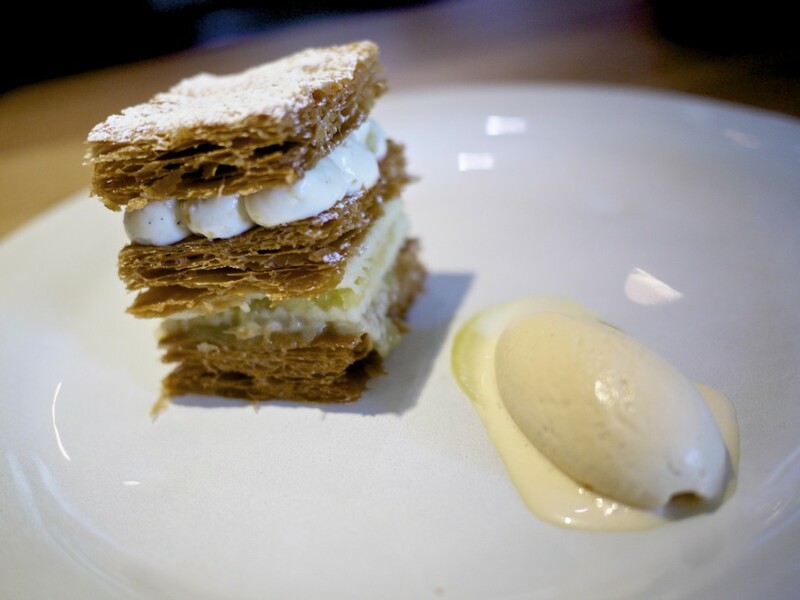 The Braeburn apple Millefeuille, caramel ice cream was my favourite dish of the day, and this was quite a statement. Given the consistently high quality dishes that kept on coming out of the kitchen that lunch, I didn’t expect the dessert to be such a knock out course. The pastry was light and flakey, reflecting the masterful skills of the pastry chef. The amount of the crème patissiere was spot on, marrying really well with the acidity from the green apple. The trifecta to complete this dish was a milky caramel ice cream which was not too sweet. Take a bit of each element and imagine the flavours coming altogether in one go – bang! Delicious. We were finally down to our last course and we could see them being prepared right in front of us. And here it was. 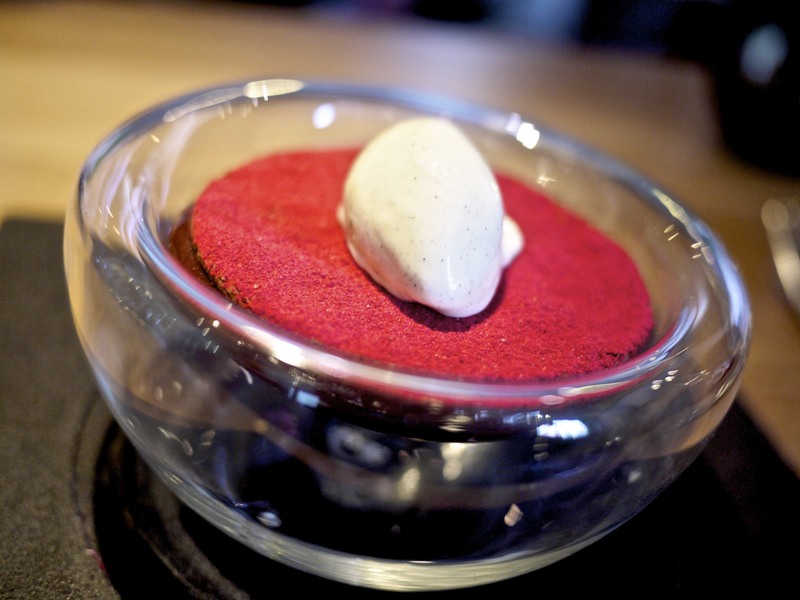 Warm chocolate, powdered raspberry, passion fruit jelly, madagascar vanilla ice cream. It consisted of a warm gooey chocolate mousse sealed with a crispy chocolate disc that had been sprinkled with powdered dried raspberry. The passion fruit jelly hidden inside was a clever and vital component to cut through the rich chocolate goodness. To finish off a quenelle of Madagascar vanilla ice cream was carefully laid on top. From my one meal at Hedone it was obvious that Mikael Jonssons cooking style was to let the ingredients speak for themselves. What sets him apart from other chefs who make similar claims was his ability in maximising pleasure by drawing out and showcasing the key qualities of his superb ingredients. He is undoubtedly not just an ingredient nut but also a chef, and a very good one at that. His deceptively simple looking dishes were some of the best I’ve had in London and his bread perhaps in the world. Despite the slight hiccough with the turbot and the insect, there’s no doubt that this was one of my most memorable meals in London. If Hedone was located on my high street I would undoubtedly be there every week but for now I would just need to relive my experience through my memory and photographs. This entry was posted in United Kingdom and tagged Chiswick, Fresh, Gastroville, Hedone, London, Mikael Jonsson, Sourcing on July 14, 2013 by admin.